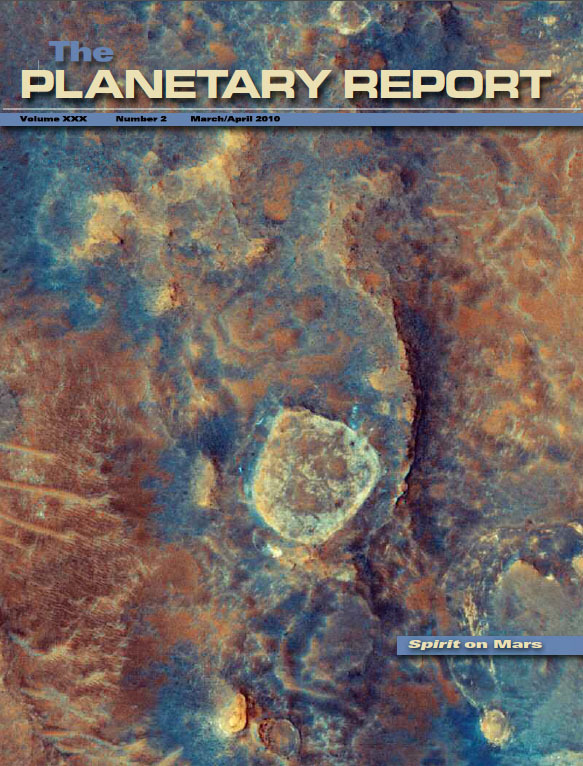 On the Cover: Spirit is the small bright dot to the left of Mars' Home Plate in this image, taken on July 16, 2009 by the High Resolution Imaging Science Experiment (HiRISE) on Mars Reconnaissance Orbiter (MRO). If Spirit does not break free, it may rest there forever. The other bright areas around Home Plate are spots where the rover has churned up the soil. 4 30 Years of The Planetary Society: Louis Friedman reminisces about his time with the society upon his retirement. 6 We Make it Happen! A New Project: Microrovers for Assisting Humans: Bruce Betts reports on an exciting new NASA-funded collaboration between The Planetary Society and Cornell University. 8 WorldWatch: Winds of Change at NASA: What are the Obama administration's plans for NASA? 10 Spirit: Not Dead Yet: Emily Lakdawalla and Jim Bell set the record straight on the current state of Spirit. 17 Annual Report to Our Members: A summary from Dan Geraci on The Planetary Society's 2009 finances and activites. 20 Q&A How can we tell how many planets are in other solar systems? 23 Society News A new online store, and happy birthday to Buzz Aldrin!